Sword and fire, be my prayer!" Joan of Arc is introduced to children as a heroine: a pioneering woman who proudly stood in the name of justice for her country and met an untimely end at the hands of men unable to tolerate her views. But Joan's story is hardly a tidy one. She was driven towards violent uprising by a voice of God that only she could hear. Even as she made every effort to shun womanhood, her authority depended as much on the power of her words as on anatomical features proving her virginity. "David Byrne's new rock musical Joan of Arc: Into the Fire aspires to be an explosive retelling of Joan's story that doesn't shy away from gruesome details or the complications of the protagonist's motivations and legacy. In many ways, the project recalls Byrne's earlier pop opera Here Lies Love, in which he explored the life of former Philippines first lady Imelda Marcos in an immersive discotheque setting. While Into the Fire lacks a participatory element, the biographical project is at its core the same: the use of a specific genre of music as a means of giving a new voice and quality to the central figure's story and character. Alex Timbers once again directs, and much of Here Lies Love's acclaimed design team return as well. Into the Fire is ambitious, skillfully sung, and often quite visually impressive, but it falters on a narrative level. While the show gestures towards the complexities behind the character of Joan (played with impressive fire and venom by Jo Lampert), it skirts around much of her back story and glosses over significant moments. This is a pervasive issue related, in part, to the fast pace of the ninety-minute show. A few minutes in, Joan first hears the word of heaven (made unnecessarily explicit by a spotlight with a shade opening and closing —an effect vaguely recalling the trumpet-voiced adults in the Peanuts TV specials). At what may be the most crucial single moment in her character's life, Lampert hardly has time to register, struggle with, question, or delight in the weight of Joan's revelation before launching into an anthem confidently declaring herself a prophet. Similarly, a test set up for Joan in the court of the Dauphin (Kyle Selig)— France's as-yet uncrowned king— is introduced as if it will have real heft and consequences. But these are hardly explored when the challenge is solved in seconds, to little response. Such moments take place throughout the show, and it leaves the characters feeling shallow, as if they're simply avatars for historical reenactment. Byrne is (needless to say) a talented musician and orchestrator, and his songs for the show make powerful use of the large ensemble cast. Over the course of the musical, though, we start to recognize echoes of the same several core arrangements reappearing time and time again. The idea of assigning each character their own musical "signature" is a compelling one—especially in a show with a multitude of smaller roles—but the execution is perhaps too reserved. The result can come off as repetitive, and threaten to cross into monotony. The staging similarly struggles to stay dynamic, given the amount of time spent with a crowd gathered around Joan as she stands center stage. The choreography by Stephen Hoggett and production design do help counter this The choreography by Stephen Hoggett and production design do help counter this, however. 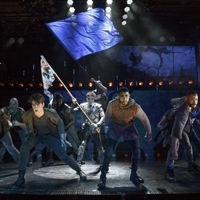 Depictions of battle in the show tend to be in the vein of the iconic Les Mis image of the flock around a waving flag, but when it comes to the actual fighting, Hoggett ingeniously uses movement to abstract and allude to battle without using traditional stage combat. Similarly, his twisting, contorting choreography deepens the impact of Joan's misfortunes after being captured by the British. Clint Ramos provides a thoughtful costume design honoring both the historical context and the rock vibe of the show. A sparse set by Christopher Barreca nicely complements the special effects design by Jeremy Chernick and the projection design by Darrel Maloney, the latter of which offers useful background information throughout the show. Lighting design by Justin Townsend further builds a sense of place and heightens the mood of the music, though the blinding reflection of the spotlight in Joan's armor occasionally proves a distracting nuisance. Of crucial importance to this loud rock musical is Cody Spencer's successfully imperceptible sound design. Actors, instruments and effects are harmoniously balanced and come through crystal clear. And while the Public (reasonably) warns perspective attendees of the "rock concert level noise," the levels are humane — no need to worry about your ears ringing the rest of the night. Despite some strong pieces, the whole of Joan of Arc: Into the Fire never ignites the way it aims to do. Because the narrative arc of the show is so rushed, much of what should be an emotionally stirring show comes off feeling distant and even clinical at times. It's clear that Byrne's concert musical sincerely wants to be a character study. Instead, it feels more like an encyclopedia entry.